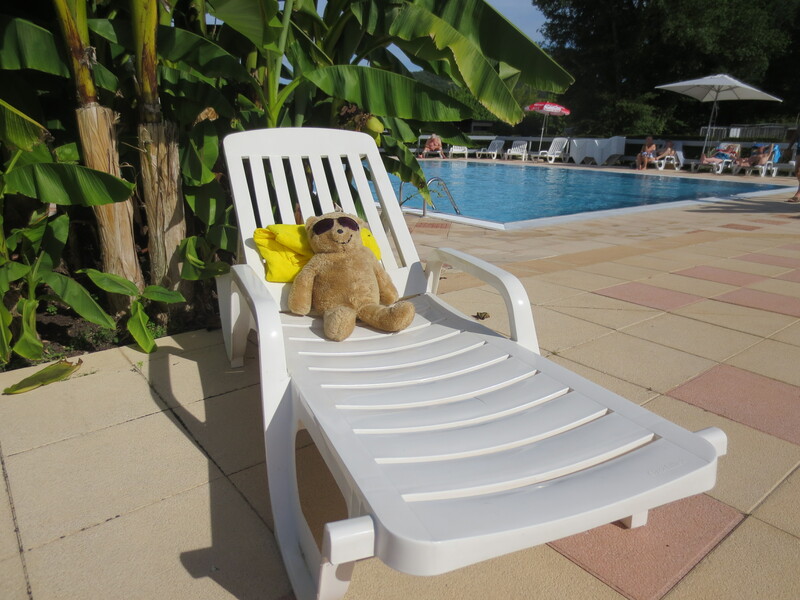 I think I should write a little bit about my recent holiday in France, my third visit and I am thinking I really should learn to speak some French. 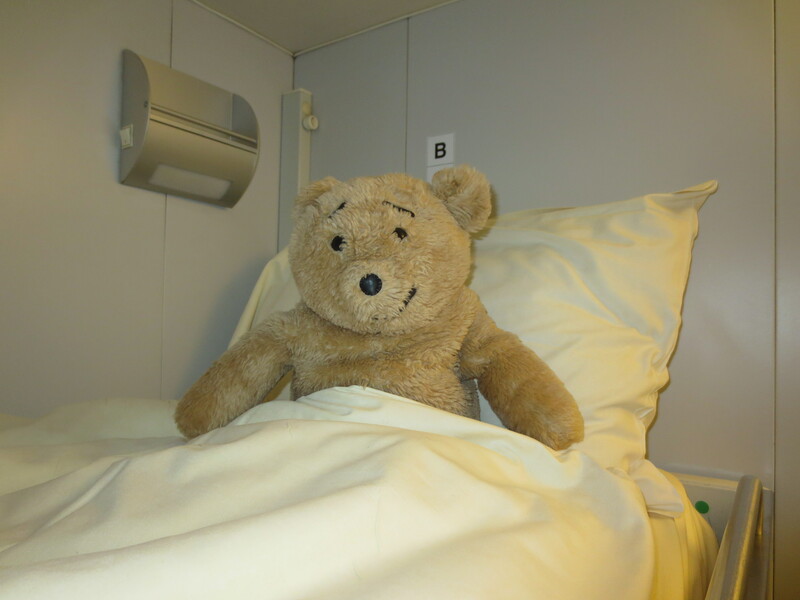 Anyway, we headed off to France on an overnight crossing, so after boarding the ferry in the footwell of the car (those of you that look at facebook will already know I get very worried that customs will think my stuffing is suspicious) I was tucked into bed in a cabin. I was woken by music playing in the cabin that got louder and louder. There have been incidents in the past with me being left behind places so Karen left me safely in the cabin while she went off to find some breakfast – for some reason she sometimes forgets that I like to eat too! I did lots on my holiday but will just tell you a few highlights. 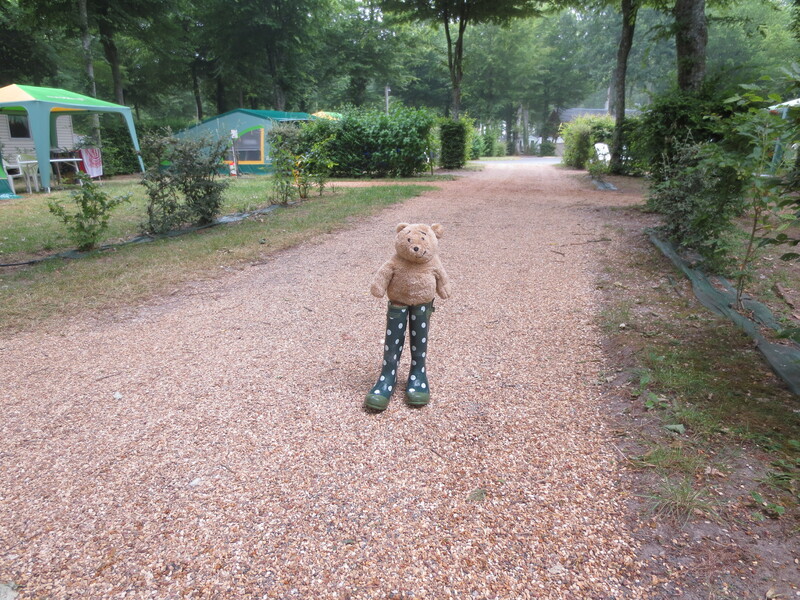 On the first morning there was a little bit of rain, so I needed wellingtons in order to venture out around the campsite. Paddington didn’t want me to borrow his for nearly two weeks, so I borrowed Karen’s instead, they are so good they have become my wellingtons of choice. 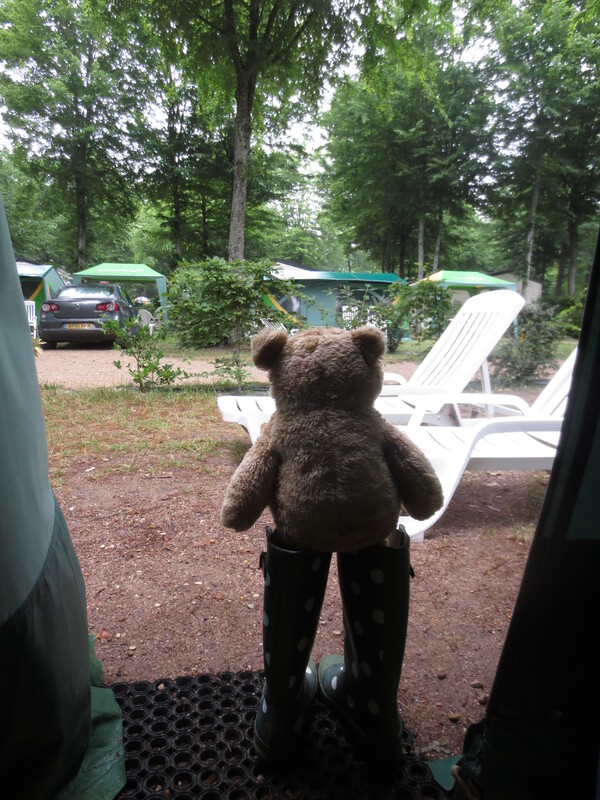 All short individuals should have some boots like this: In no time I was off exploring my surroundings: The rain soon went away and we also moved to another campsite, where the highlight for me was the canoeing trip. 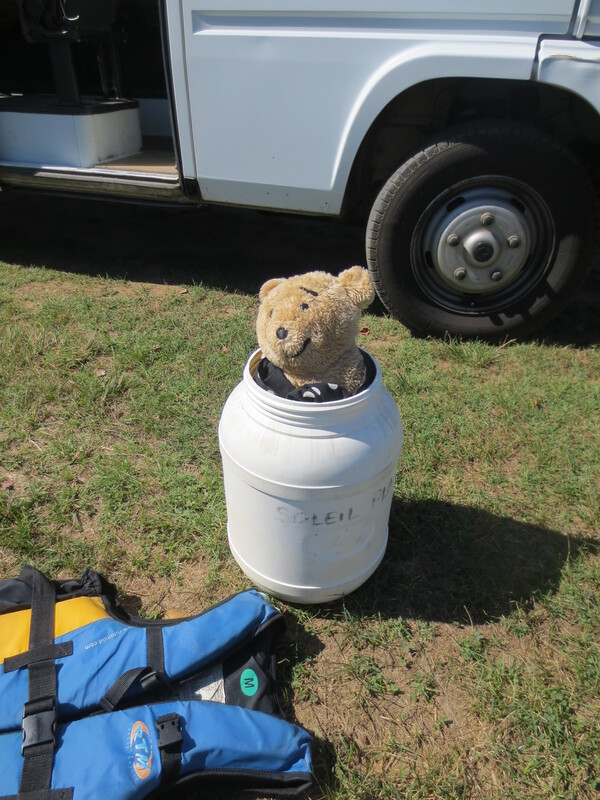 Initially I was put into a barrel to keep me safe in case the canoe capsized: The lid was even done up – it wasn’t pleasant in there at all. I was very very pleased when only after about 5 minutes on the canoe in the barrel Karen rescued me, and as the water was so calm, she even let me do the paddling for a while. My fur and stuffing is always a problem with regards to watersports, as when wet I turn into a soggy lump. Hence at the swimming pool I had to be content with peering into the water looking for fish, but there weren’t any that I could see. 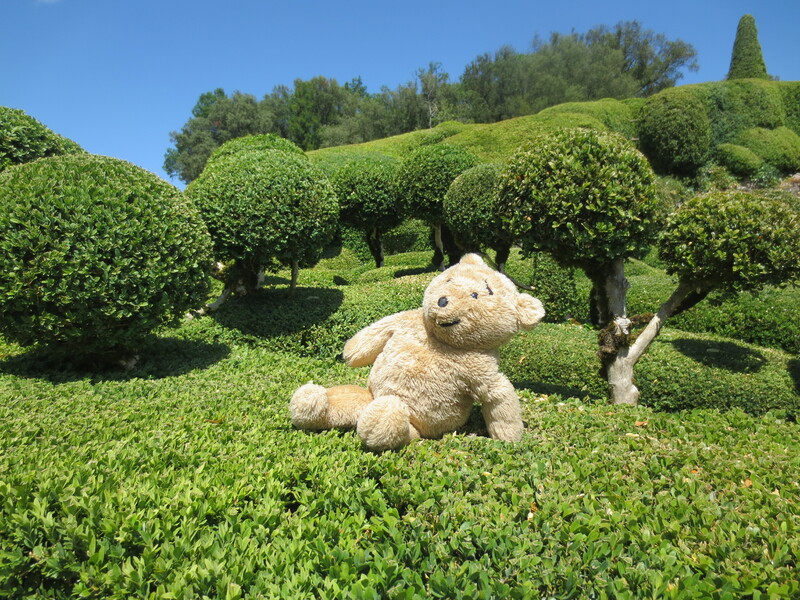 We went to some wonderful gardens where the hedges had been cut in shapes (topiary I have been told). They are called the Gardens of Marqueyssac . 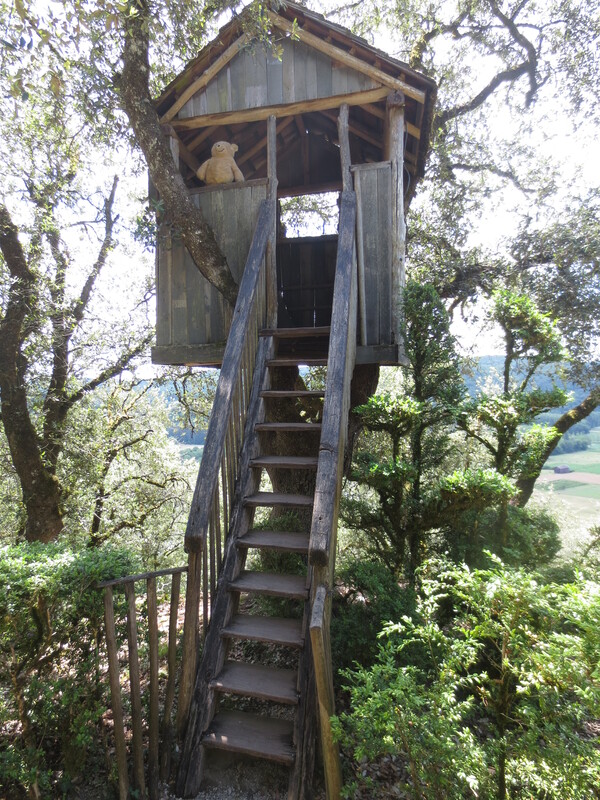 The thing I liked best there was the tree house, which wore me out a bit climbing up the ladder. 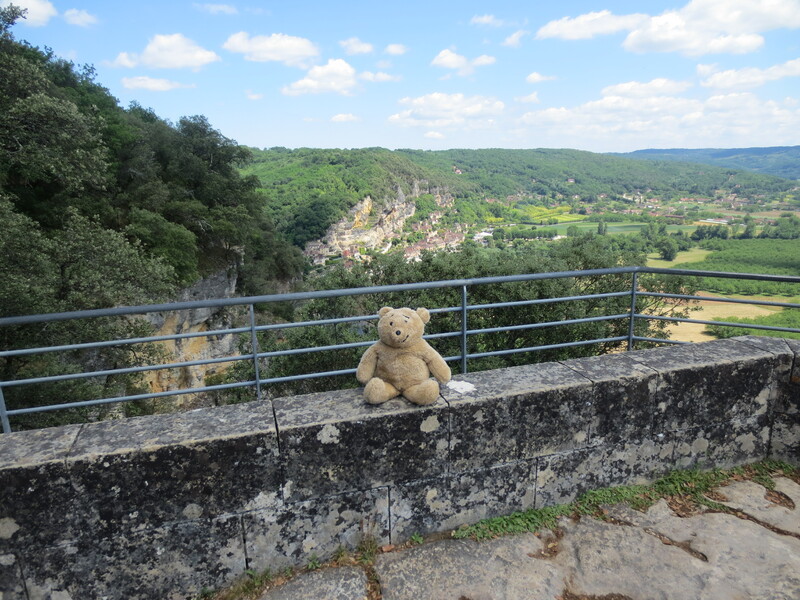 I was carried in the bag all the way to a cliff top view point, which didn’t sound very interesting for a bear, but when we got there the view was amazing. All the hay bales looked tiny and I could see the river that I was canoeing in just a few days before. 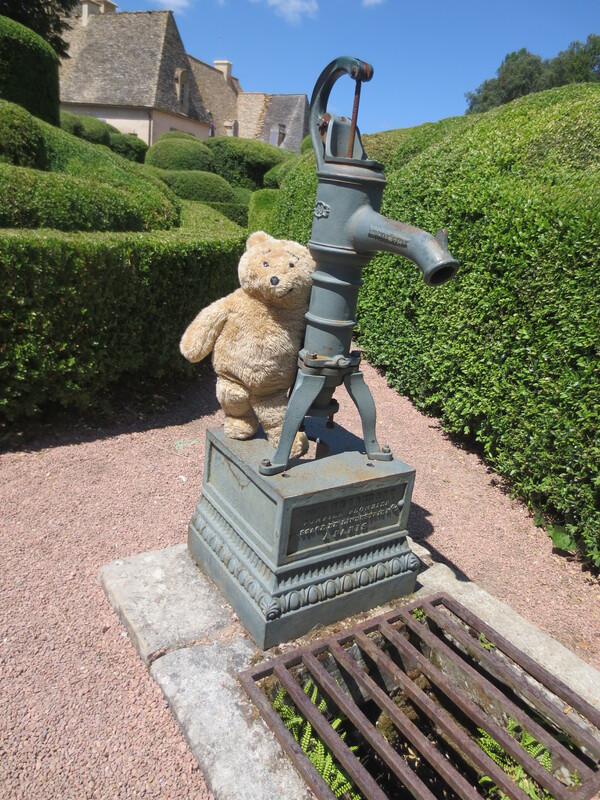 There was also a very interesting water pump (though no water came out) that I think Growler would have liked. Perhaps I will be allowed to bring a friend next time we go away. 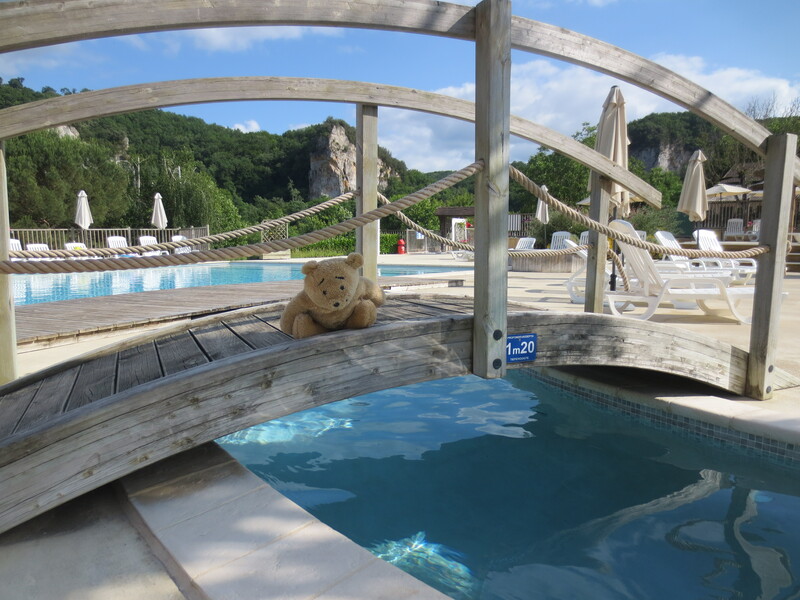 One of the sites where we stayed had some bear sized climbing equipment that I rather enjoyed using …and yet another swimming pool for me to sit by but not get in. I only sat in the sun for a very short while though as Karen says I am like National Trust furniture and I must be kept out of the sun otherwise I could fade and disintegrate (whatever that means….) 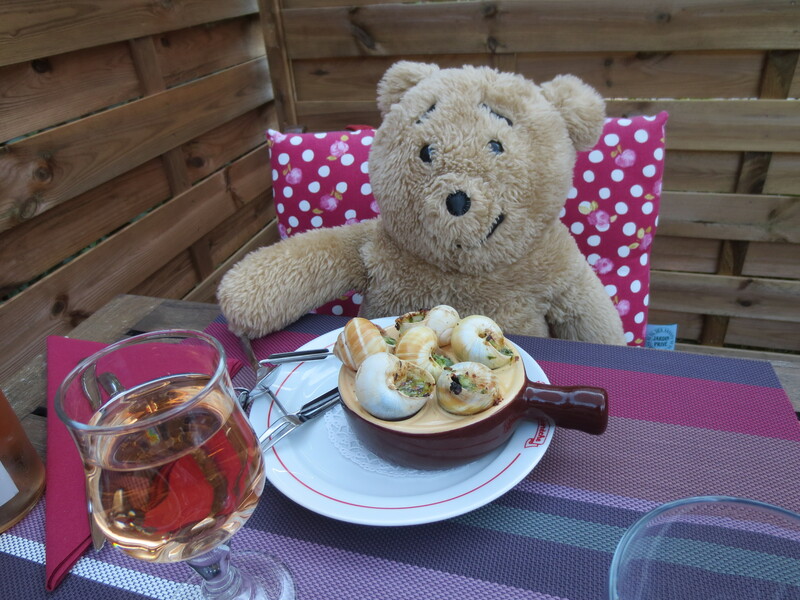 On our last evening in France I was taken to a restaurant to for a traditional French meal. I didn’t like the look of the snails though so gave them to Karen. I still can’t believe she really did eat them! 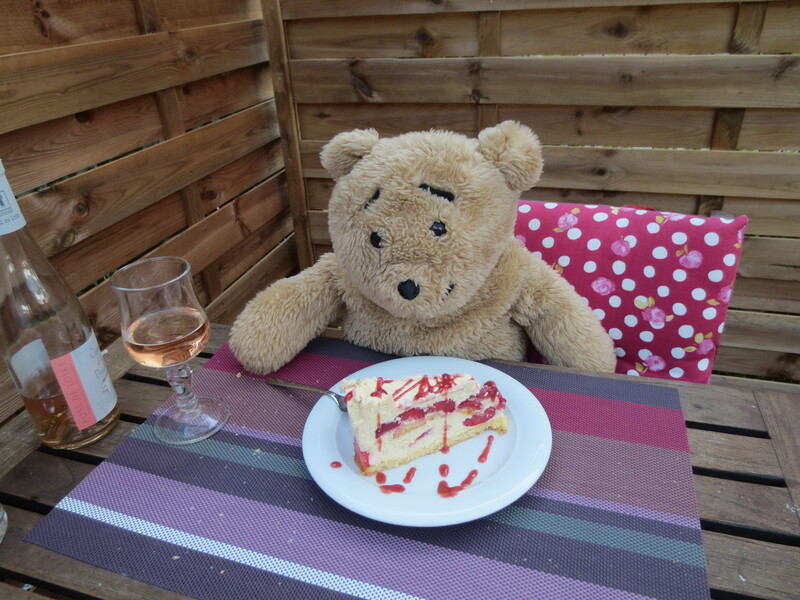 I did however like the strawberry cake, that had lots of tasty creamy stuff inside it. 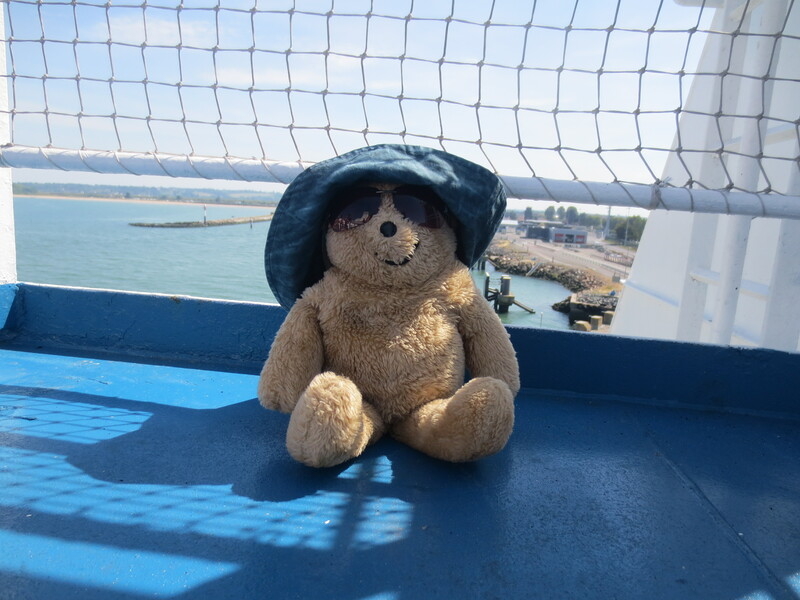 We travelled back to England on a daytime ferry so I was able to sit on the deck and watch as France got smaller and smaller. (I turned around for the photo, as I don’t think I look that good from behind) When we reached Portsmouth Karen made sure I was safely in the bag to get back down to the car deck ready for the drive back to Bristol. Now I am wondering where they will take me next….. 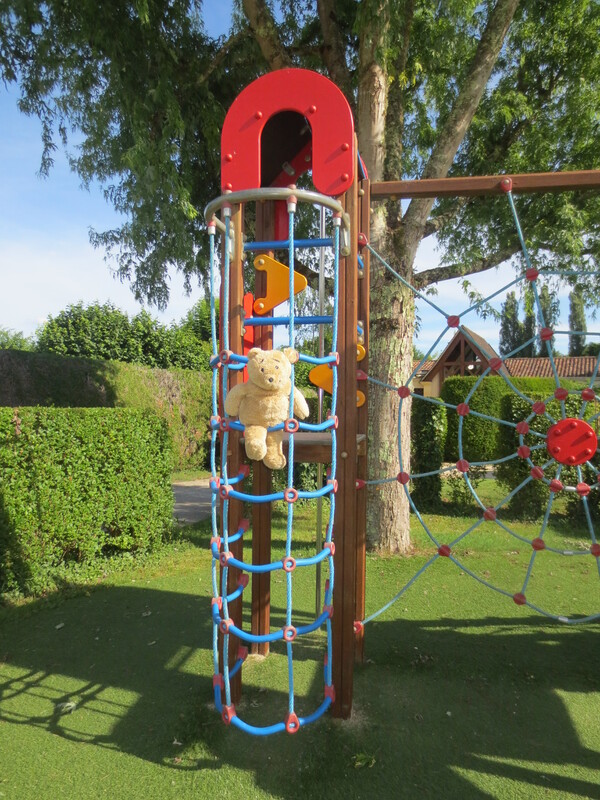 This entry was posted in Uncategorized and tagged Dordogne, Eurocamp, France by karenlovestodance. Bookmark the permalink. What campsites did you stay on Horace?